Last week, we saw several highs and lows in the mortgage industry. The average 30-year fixed mortgage rate marched to a 7-year high of 4.66%, a level not seen since May 2011, and not ever seen by the current generation of Millennial first-time homebuyers. 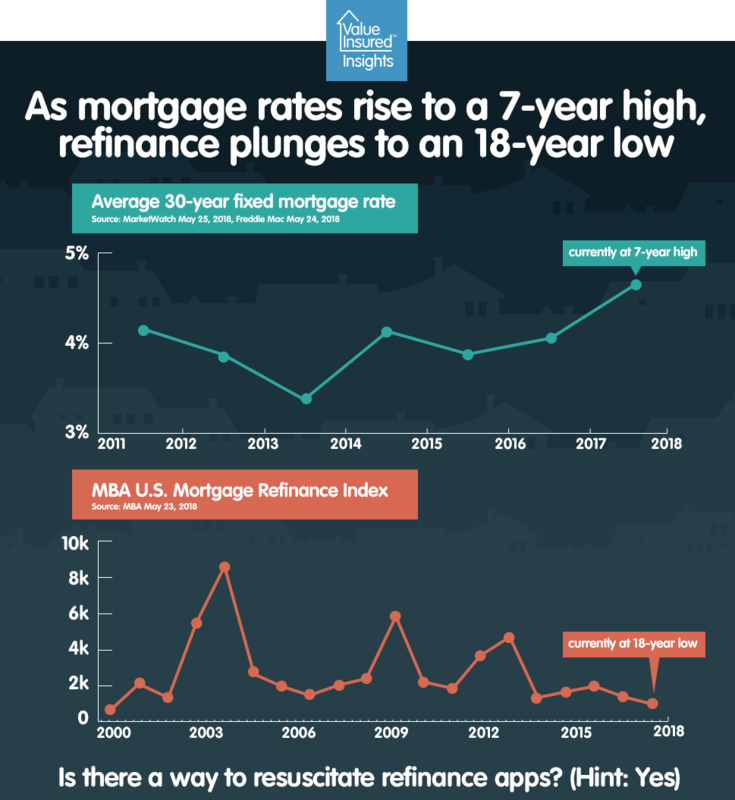 Coincidentally, mortgage applications plummeted, most noticeably for refinance, which fell to an 18-year low, according to the MBA. The mood for mortgage lending has been somber, to put it mildly. MBA’s chief economist predicted our country’s mortgage lenders likely posted operating losses for Q1 2018. According to the MBA, net production margin fell to 9.3 basis points in Q4 2017. This is a sobering contrast compared to the historical average of 55 basis points on mortgage operating income. The silver lining is that Americans still want to own homes. The desire is consistently high at 77% among millennials, according to ValueInsured’s latest Modern Homebuyer Survey in Q2 2018. Many will continue to buy and apply for purchase mortgages, even at today’s high prices (though 62% believe these homebuyers will likely regret it soon after buying). However, refinance is a different story. People need homes to live in, but fewer need to refinance. As rates rise, refinance has slammed to a halt. Loan officers who have seen their business flourish in recent years are now pushed out of the sector. The CEO at Ellie Mae went as far as saying refinance might not come back for years. All this doom and gloom may be operating on old assumptions about mortgage refinance. Historically, refinance activities and interest rates are closely – or more accurately, inversely – correlated. Homeowners’ primary motivation to refinance has been to lower their monthly mortgage payment. But as cash-out refinance becomes more popular, homeowners now have more than one reason to refinance. Particularly in this expensive home-buying climate, homeowners are using cash-out refinance to fund renovations and expansions as an alternative to upgrading to a new home. Many are also using cash-out refi to pay for college tuition, credit card debts, family emergencies, vacations, to inject funds into a business or investment; some are cashing out to fund a vacation home, rental home purchase, or to help their children buy a home. However, homeowners now have a new reason to refinance, and it may just be the secret weapon the mortgage industry needs to survive this alarming refi drought. Home prices have reached record-high in many top metros, but if you have paid attention to any local realtors, to CoreLogic, or to housing experts and economists here, here, and here, many of these markets are overvalued and are expected to correct. In ValueInsured’s latest quarterly survey, 68% Americans believe a housing correction will happen within 2 years. Interestingly, the consumer survey was conducted before releases of the Zillow and Wall Street Journal economist panel reports, but their prediction timeline mirrors those of the experts’. Historically, homeowners’ choice when faced with a potential correction is to sell (but then where would they live? ), or to stay put and risk watching their home value depreciate in the near future. Those are hardly good options and the bottom line is, the homeowner themselves have little to no control. Now, they have a third option of refinancing with Equity Protection where they can lock in their home value at market high. It’s an insurance policy against market risks and potential home value loss. Sure many homeowners have already refinanced when rates were half a percent lower and they saved $300 a month, but those savings might not amount to much if their home value plummets by 55%, 33%, 32%, 31%, 36% as they did in Miami, Atlanta, San Francisco, Seattle and San Diego respectively in the last housing recession, after reaching then market highs (they are even higher now). Homeowners now have the option to take advantage of the market peak, cash out or lock in their current home value without selling, and have their loss reimbursed back to them if they sell for less later. It’s a new and compelling reason to refinance in plain sight, and it just may be the fin-tech innovation that could save mortgage refinance, even as rates continue to rise.